Short answer: for what you are wanting, boil it with a little lemon juice / citric acid. Then bring it back to 7.0 or so with baking soda. Long answer: depending on the ratios, temp, and timing you can get anything from a colloidal suspension of unmodified starch to a plastic hard enough to make small toys out of (recipes on the plastic end of the spectrum tend to involve glycerin or similar as a softener). So try it and see what you get. I’d suggest getting a bunch of disposable cups and follow a protocol roughly as follows: do several midsized batches with varying citric acid / starch / water ratios, then pull out samples after various cooking times (t=0=start of boiling; before that I suspect not much will have happened). Neutralize each sample by putting it in a (pre-labeled) sample cup with an appropriate amount of NaHCO3 (predissolved in a minimum of water) & mixing immediately. If non of these give you what you want you may want to try cooking after neutralization, but that makes it harder to cover the pre-neutralization parameter space. Ah, thanks for the tips! I’m hoping to use a mix of pectin, gelatin, and starch for my final product. The goal here is to be able to more or less pig out on as much of whatever I come up with as I might want. 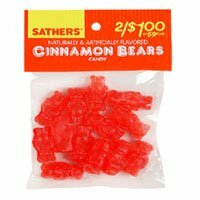 The starch, of course, is a digestible carbohydrate (and now that you got me thinking about it – it looks like the sugar is less than half of the carbohydrate calories in Cinnamon Bears! 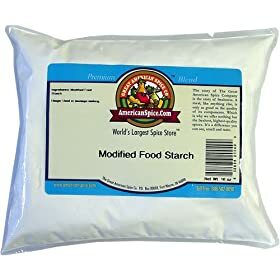 Presumably the rest is the modified food starch, since there’s not much else…). I tend to agree with Foamy the Squirrel about “Atkins”, but if I can keep the level of starch down it’ll help keep the stuff minimally fattening. Pectin being a soluble fiber, I can use it for bulk. Gelatin technically has “calories” of course, being a low-quality protein, but for my casual “diet” (such as it is) purposes I’m allowing myself all the proteinaceous material I feel like eating. I do actually have a bag of citric acid that I’ve recently rediscovered (I bought it quite some time ago and forgot) – I’ll have to give the experiments a try when I get a chance. One advantage of modified starch over pectin / gelatin in my experience (limited to minor food hackery of this sort and a few attempts at DIY plastics and such) is that it doesn’t denature / go weird as easily. I’ve found that changes in water content, temp, or exposure to trace quantities of various enzymes (I’m guessing) can turn them into sludge over time while the tangled mass of amylopectin from (aka modified starch) retains it’s texture. Previous Previous post: Meme me!